An app is a software application designed for mobile devices and tablet computers. For you and your practice, it's an effective technology for connecting with pet owners, building loyalty, bringing business through your door, and increasing revenue. A veterinary hospital app is also an excellent way to further differentiate your practice from competitors by increasing the service, value, and convenience that you are able to offer pet owners. Once downloaded to a smartphone or tablet computer, your veterinary hospital's app becomes a permanent icon on a pet owner's screen. Specifically designed and developed for your veterinary hospital, your app allows pet owners to access your content quickly and easily—and most importantly, frequently. Cumbersome internet searches, which also bring up your competitors’ information and websites, are a thing of the past. Now, everything your clients want—hospital phone number, appointment requests, directions to your hospital, prescription refills, relevant local "breaking" veterinary news, pet care tips, medical articles, medical & veterinary dictionary, emergency contact information—is available at the touch of a finger. 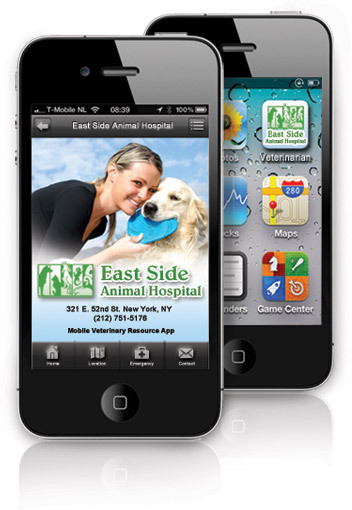 As the smartphone market grows, so too do the opportunities for marketing your veterinary hospital. Innovative use of mobile app technology keeps your clients in touch with you and helps maintain their loyalty. According to recent Harris Interactive surveys and polls, nearly 21 million people are using smartphones in the US, and of these people, approximately 70% have downloaded and used custom apps. Your veterinary hospital's app will keep you connected to your clients 24/7. If you do not act now to engage these tech savvy pet owners, you risk losing business to a forward-thinking competitor. Your Social Media Sites – Facebook, Twitter, YouTube, etc. View VetNetwork's video for a comprehensive look at the benefits and features of a veterinary hospital app for your practice. Don't miss out on a great opportunity. Be the first veterinary hospital in your area to have this technology available to local pet owners. To learn more about how an app can help grow your practice with comprehensive veterinary marketing services, give us a call at 800-564-4215 or email us today.